Route 66 — The Mother Road. This 2,500-mile highway stretches from Chicago, Illinois to L.A. in California. The most popular road trip option in the late 1940s and early 1950s ceased to be considered an official road in 1985. The people, however, would not accept it and this route remains a popular attraction. Although sections of the road are no longer intact, many of the sites, scenes, and curiosities that had made their homes along the stretch still exist. Drive through naturally existing rock formations in Arizona, and visit the Route 66 Drive-in Theater in Carthage, Missouri. 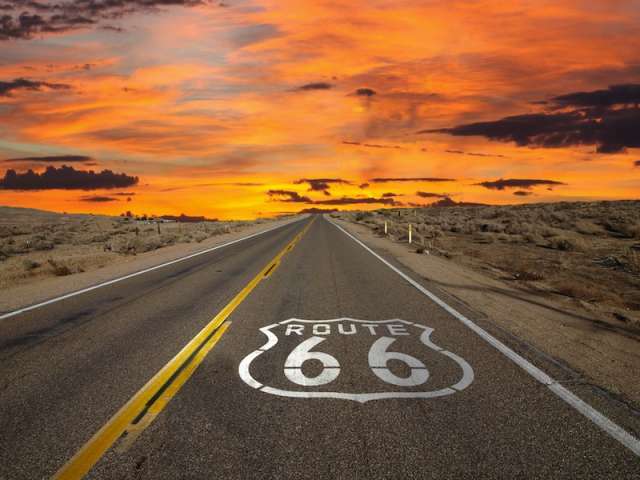 If you find yourself itching for a road trip, share this with your favorite driving companions and head to Route 66. Perhaps the most obvious attractions on the iconic highway are the natural wonders and vistas that dot the areas through which it passes. 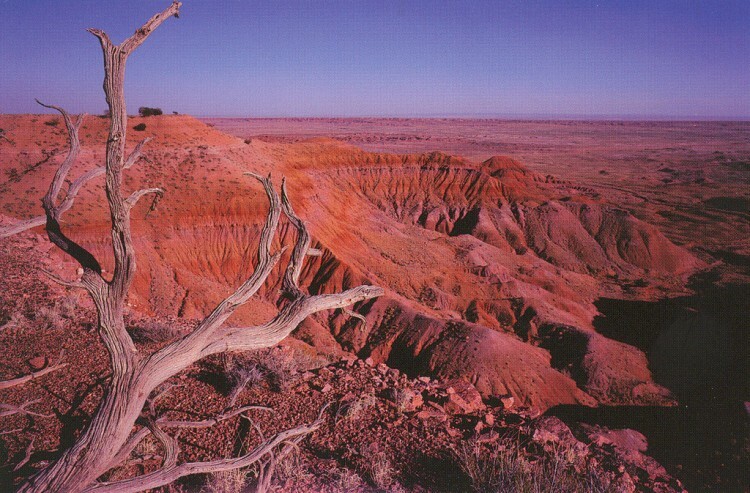 Visitors gaze in awe at the natural formations in the Petrified Forest and the Painted Desert in Arizona. On your way through, check out the enormous and impressive Meteor Crater, also found in Arizona. In New Mexico, you can go for a swim in the Blue Hole of Santa Rosa. Visiting these rare sites tends to put time, space, and everything else in perspective. When traveling through the Wild West consider stopping by one of the several ghost towns found on Route 66. Some, such as Oatman, Arizona have staged gunfights, wild donkeys wandering the streets, and gift shops. The locals consider it a “living” ghost town. 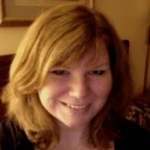 There are other less active options with a range of levels of preservation. Calico, California, for example, is maintained by a park system and has a campground, which allows guests to explore the haunt for days–and nights–at a time. 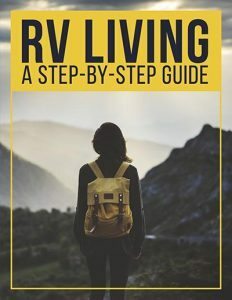 More rustic choices include Amboy, California; Anaconda, New Mexico; Hackberry, Arizona; Hext, Oklahoma; and Clementine, Missouri to name a few. 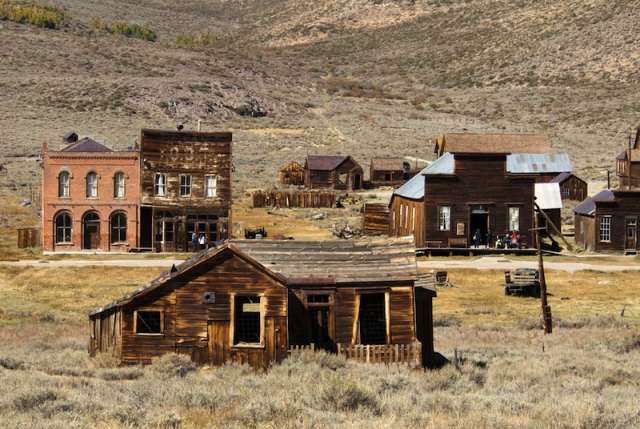 With a little research, you could visit a couple of ghost towns in each state you cross. Due to the constant stream of new tourists passing through on the Route, many roadside attractions cropped up over the years. 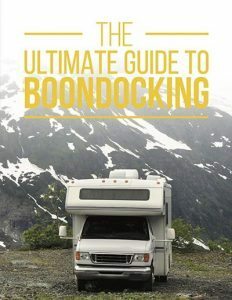 From viewing “the World’s Biggest” to buying “the World’s Strangest,” for those who like oddities, there is nowhere better. 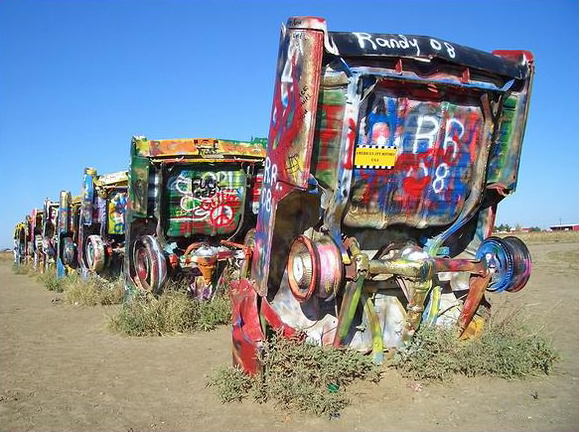 Some of the highlights on the drive include the World’s Biggest Bottle of Ketchup and Cadillac Ranch in Amarillo Texas, where–with a can of spray paint–you can contribute to the installment piece. 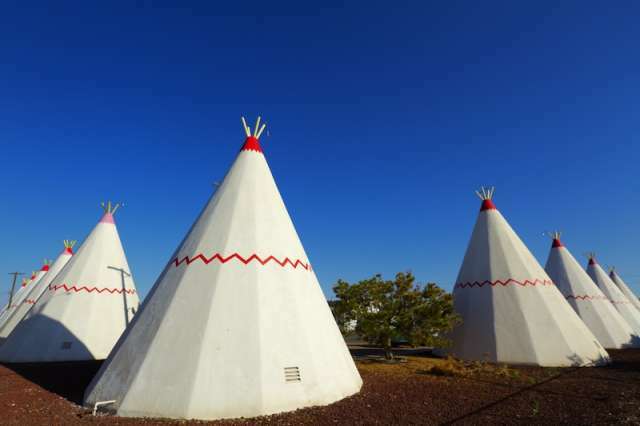 Stay in a tee pee shaped motel room at one of several Wigwam Villages. Then shop for curios at Tee Pee Curios in Tucumcari, New Mexico where the whole town of Tucumcari appears to be frozen in time. This way you can have a memento to remember your time on the road. 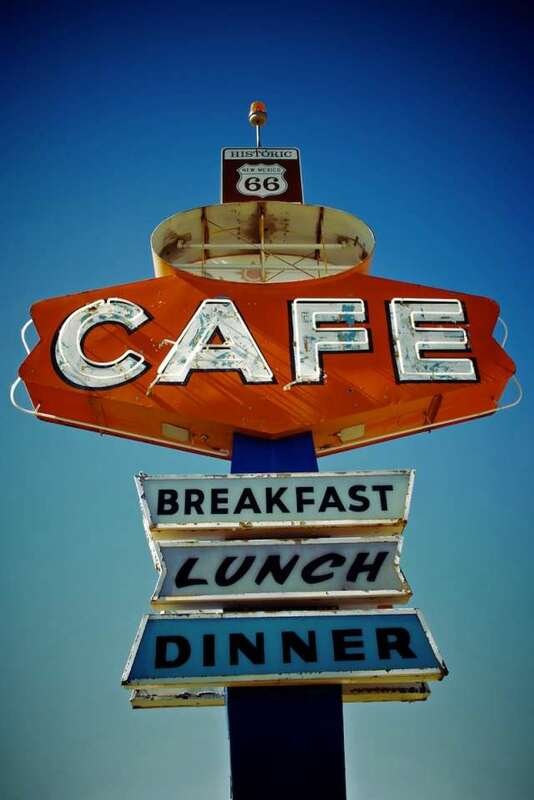 When people think of Route 66, many anticipate drive-ins and greasy, finger-licking burgers. In fact, there are many great places to eat on the route. This is especially true if you like classic American cuisine, but there is a wide variety to choose from. For example, you can get some fried chicken and home cooking at Dell Rhea’s Chicken Basket, which has been in business since 1946. In New Mexico, you can get the green-chili burger at the Badlands Burgers, which was previously called the “Uranium Café.” Check out Oklahoma and Texas for fantastic barbecue; both states are renowned for their meats. Then cool off at an Old West style saloon like Roadkill Cafe & OK Saloon. You have plenty of eateries to choose from on this road trip. 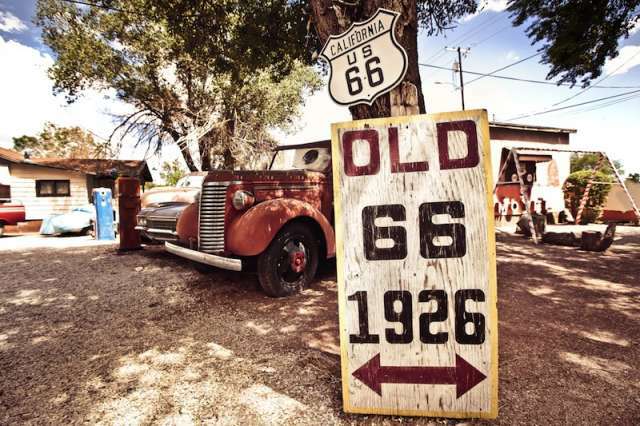 Although the glory days of Route 66 may be in the past, it still provides old-school Americana. From the majestic scenery to the kitschy shops of oddities, from the ghost towns to the notoriously delicious burger joints, it’s like traveling back in time. 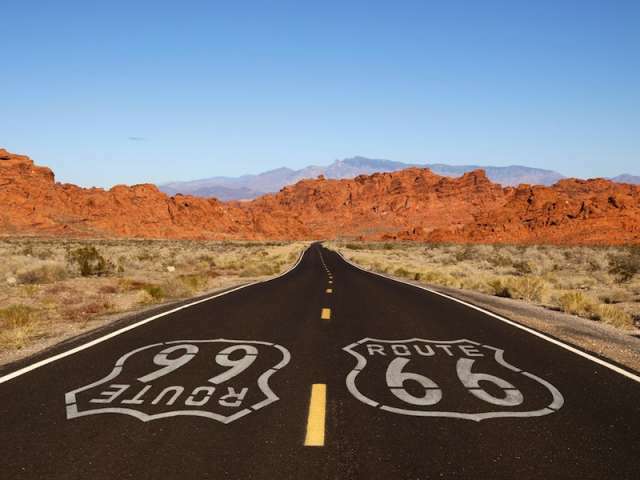 Please share with your friends and family and if you’re looking for an old-fashioned road trip, check out the ultimate “Mother Road” — Route 66!